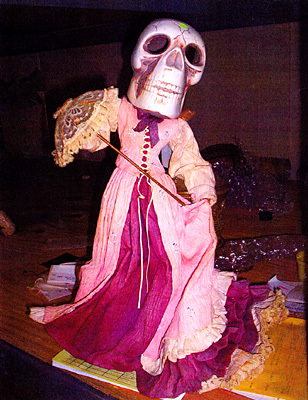 This is a picture that appears to be a Victorian-style doll with an over-sized skeleton head fitted over the original head. I work for a design firm. I found it in the bottom drawer of my desk when I first started working here. I’ve heard rumors from my co-workers that this skull head was also placed on the body of a deformed frog in another picture somewhere in the building. My New Year’s resolution is to find that photo and laugh at it.